Travels with Andrew, Heide and Lachlan. Stories, photos, tips and recommendations for family travel. This what your Airports and Sunsets Blog Ad will look like to visitors! Of course you will want to use keywords and ad targeting to get the most out of your ad campaign! So purchase an ad space today before there all gone! After our visit to Hiroshima and a stop in Himeji, our next adventure was a few days in Osaka. After seeing so many temples, shrines and palaces in Kyoto, we focused on more modern sights during our time here. Our first stop in Osaka was the Osaka Aquarium Kaiyukan. This aquarium is reputed to be one of the best in the world, and it didn’t disappoint. Even before we bought our tickets to enter we were impressed by the fun aquatic life mosaics on the outside of the main aquarium building. The aquarium has some very impressive inhabitants. I’m not sure whether whale sharks should be kept in aquariums, but it was a pretty amazing sight to behold. The enigmatic sunfish was another highlight. The sea lions drew an admiring crowd to see their playful antics. The aquarium had lots of other less spectacular but still very interesting exhibits, it took us quite a while to get through them all. Overall we would definitely recommend a visit to Osaka Aquarium Kaiyukan if you have a few days in Osaka and have any interest at all in the weird and wonderful creatures of the sea. Right next to the aquarium is the Tempozan Ferris Wheel, one of the largest ferris wheels in the world. The wheel provides spectacular views over Osaka city as well as the harbor and the aquarium. With a few days in Osaka to fill, we had time for a day of somewhat random wandering through a few different neighborhoods. We started in Amerikamura (“America Village”). While this is a little bit like the equivalent of a Chinatown in a western country, it’s really more of a center for youth culture. As such, it’s a great place to wander through and see some of the weird and wonderful expressions of modern Japanese culture. Amerikamura is a great place to grab some Japanese street food, including the famous Osaka specialty takoyaki (octopus balls). After Amerikamura, we headed towards Osaka’s famous covered shopping street, Shinsaibashi. On the way there we passed some whimsical signs for some local businesses. We made it to Shinsaibashi just in time to get under cover as the rain started. We did a little shopping at Uniqlo, then joined the crowds making the way to our next destination. The next stop on or DIY walking tour of Osaka was also our dinner stop. Dotonbori is one of Japan’s famous restaurant districts, and Osakans are known for their love of food and a good time. Before finding a place to eat dinner, we spent some time exploring the vibrant sights of Dotonbori. As well as food, Dotonbori is also famous for it’s neon signs and crazy (and three dimensional) restaurant signs. The view of the neon lights on the canal is reminiscent of the sci-fi film classic Bladerunner. After a couple of hours spent in Dotonbori’s sensory overload, we were ready for dinner. We checked out a few options before deciding to get some sushi from a very traditional sushi restaurant. After dinner we did a little bit more sightseeing. We checked out the Hozen-ji temple with its moss-covered Buddha. The tradition is for temple visitors to pour water of the Buddha statue for luck. Over the years this has resulted in a thick covering of moss all over the statue. The paved streets and traditional buildings around the temple, along with the quieter atmosphere away from the busy restaurant streets give a hint of what Dotonbori was like in years gone by. By this time we were weary from our day’s wandering, so we headed back to our AirBnB apartment about ten minutes walk from Dotonbori. With a few days in Osaka, we had time to include a day trip to Nara for most of our group. However, Lachlan was tired of temples and I had already been to Nara, so we stayed in Osaka to spend some more time enjoying modern Japanese culture. As it turned out, we spent most of the day in and around Osaka Station. Not just a place to catch trains, Osaka Station has all sorts of things to see and do. Our first stop was an arcade to play some video games. There are video game arcades all around the world, but Japan is pretty much Mecca for gamers, so the arcades there are spectacular. We were greeted at the arcade entrance by a friendly robot. Lachlan particularly enjoyed the games that involved repeating patterns and sounds on some sort of keypad. It sounds simple, but they are addictive. It’s also worth watching the local kids play these with astonishing skill and timing. The patterns get incredibly fast as the levels increase. Our next stop was the Osaka Pokemon Center. After this very necessary stop, it was time for lunch. Lachlan’s favorite Japanese food is unagi (grilled freshwater eel). His goal was to eat unagi every day we were in Japan. He only failed in this quest because of one day when he bought a bento box for the train that he thought was unagi, but turned out to be pork. As a special treat we went to a fancy unagi restaurant in one of the department stores in the Osaka Station building. The unagi here was definitely a cut above all the other unagi we tried in Japan. There were also cool views into the Osaka Station building from the restaurant. Our final stop for the day was Knowledge Capital, in the Grand Front Osaka building next to the station. This space showcases new technologies presented by start-up companies and research institutes. We found it a bit smaller than we thought it would be, and Lachlan was too young to use any of the exhibits that used VR goggles, but it was still interesting. We did get to virtually try on some clothes. The suit I tried on didn’t quite fit me. After our Osaka Station adventures, Lachlan and I went back to our AirBnB apartment and rested for a while, before rejoining the rest of our group in for the last excursion of our few days in Osaka. Our first stop was actually back at Osaka Station for some ramen, which was very tasty. After eating our fill, we made our way to the Umeda Sky Building, to take one last look at Osaka from a high vantage point. The views from the top are good, and the building has an interesting futuristic style. It was a fine finale to our few days in Osaka. The next day we took our last shinkansen ride to our final destination in Japan – Tokyo. Osaka is a great place to experience both modern and traditional Japan. It’s more of a living, working city than a place like Kyoto, so you can get a taste of how Japanese people live, and especially how they enjoy themselves at the many different restaurants and bars in the city. AirBnB is a good option in Osaka, with plenty of listings available for different group sizes and in different parts of the city. Our AirBnB apartment was one subway stop away from Dotonbori, which was a great location. You can save money by staying further away from the action, but some of the savings will be offset by transport costs and time spent traveling to sights. If you only have a few days in Osaka I would recommend staying as close to Dotonbori as your budget allows. If you haven’t tried AirBnB before, you can use this link to get a discount on your first booking (disclosure – we’ll also receive an AirBnB credit to help us continue our travels). Osaka has a subway system with two lines (the north/south Midosuji Line and the east.west Chuo Line) that are the most useful for visitors. The Osaka loop line is also useful, especially if you have a JR Pass which is good for travel on this line. See this site for a much more detailed rundown on transport options in Osaka. Although a few days in Osaka was not enough time to see everything the city has to offer, we had a great time here. It’s one of my favorite places in Japan, and I would definitely recommend including it in your Japan itinerary. The post Japan – a Few Days in Osaka appeared first on Airports and Sunsets. After our too-short visit to Hiroshima, it was time to make our way to our next stop, Osaka. Along the way, we visited Himeji Castle. This is one of the most famous castles in Japan, and well worth a visit. The town of Himeji is right on the Shinkansen line, so is a very easy stopover. After getting off the Shinkansen at the relatively small Himeji Station, we stored our luggage in some conveniently located lockers. Exiting the station, we found ourselves on the main street leading to Himeji Castle. You can easily see the castle from the station, and you just stay on the main road to get there, so you can’t get lost. After enough of a walk to stretch our legs after the morning’s train journey, we made it to the entrance to the Himeji Castle grounds. Not too far inside the grounds we came across a large open area that is ideal for group pictures with the castle in the background. As you keep moving towards the castle, you can see some nice views of the castle framed by outbuildings and walls. Even the outbuildings show details that indicate this has been an important place through Japan’s history. After paying our entrance fee, we made it inside the inner castle walls. By this time we really had to crane our necks to look up at the castle. Near the main castle building we saw a section of wall with the outer stucco removed, showing the rammed earth construction technique. We entered the main castle building not knowing what to expect. It turned out that we were able to make our way all the way to the top of the castle, via staircases that became steeper and steeper as we got higher up. The light wasn’t good for photos inside the castle, but I did manage to get a shot of an ornate storage compartment on one of the levels. The view from the castle got progressively better as we climbed to the higher levels. It was quite a workout climbing all the way to the top level. However, it was worth it to see the interior construction of the castle and for the views. After exiting the main castle building, we passed through an interior courtyard that provided a great perspective on how big Himeji Castle is. The castle alone is worth a stopover in Himeji, but if you have enough time there are other things to see around town. There is a sightseeing bus that makes a loop stopping at Himeji Station and the major sights. We had time to get to one of the other major sights in Himeji, Kokoen Garden. This place is only a few minutes walk from Himeji Castle, so is an easy addition to a castle visit. Kokoen is actually a series of different themed areas, showcasing a number of different Japanese garden styles. There are places in the gardens where the castle can be seen in the background. Some of the gardens have been artfully arranged to incorporate castle views into their design. After we had seen most of Kokoen Garden, it was time to continue our journey to Osaka. We caught the sightseeing loop bus back to Himeji Station, looking forward to getting back on the train to rest our legs. Himeji had one more surprise in store for us, when we came across Princess Shiromaru (Himeji Castle’s mascot). We had “met” her in an augmented reality tour on our cellphones at the castle, but it was fun to see her in real life just before we left Himeji. The post Japan – Himeji Castle appeared first on Airports and Sunsets. After our adventures in Kyoto (day 1, day 2, day 3), our next stop was Hiroshima. With two nights here, we only had time to see the major sight in Hiroshima – the Hiroshima Peace Memorial Park, and to do a day trip to Miyajima Island. There are other things to do in Hiroshima, like visiting the Mazda museum, catching a Hiroshima Carp baseball game or checking out the excellent contemporary art museum. We’ll have to make it back to Hiroshima some day and spend more time there. Note – this section contains an affiliate link. If you book through this link we’ll make a small commission at no extra cost to you. We took a morning train to Hiroshima from Kyoto and arrived just at the right time to have some lunch before exploring the Hiroshima Peace Memorial Park. Because of our limited time in Hiroshima, we decided to stay at the Hotel Granvia, which is conveniently attached to the train station where we arrived. Adding to the sightseeing efficiency of the location of our accommodation, there is a sightseeing loop bus that leaves right from the station. This bus will take you to all of the tourist sights in downtown Hiroshima. A number of these sights commemorate the dropping of an atomic bomb on Hiroshima at the end of World War Two. These sights are all grouped together in the Hiroshima Peace Memorial Park. This park was built on the open space left when a central section of downtown Hiroshima was destroyed by the atomic bomb blast. There are memorials to the victims of the blast, and monuments advocating world peace. In addition to these, there is a museum that tells the story of the tragic events of 1945. The overall theme of the Hiroshima Peace Memorial Park is simple – “Never Again”. The bus dropped us close to possibly he most significant sight in the Hiroshima Peace Memorial Park, the A-Bomb Dome. Grey skies and intermittent rain seemed appropriate to the seriousness of the memorial. The A-Bomb dome is what remains of the Hiroshima Prefectural Industrial Promotion Hall. This is the building closest to hypocenter of the atomic bomb blast that remained at least partially standing. It has been preserved in its damaged state in memory of the casualties of the blast. We next made our way to the monument placed in memory of the children who died in the blast. A girl with outstretched arms and an origami crane stands at the top of the statue. The origami crane has become a symbol of Hiroshima. This is based on the story of a young girl who died from radiation poisoning from the bomb. She folded 1,000 paper cranes in the belief that she would be cured. To this day, people from around the world continue to send origami cranes to Hiroshima. Other monuments in the Hiroshima Peace Memorial Park include the Peace Flame and the Cenotaph. The Peace Flame has burned continuously since 1964. It will remain lit until there are no nuclear weapons in the world. The Cenotaph holds the names of all of the people killed by the a-bomb. This monument is positioned to line up with the Peace Flame and the A-Bomb Dome. There are quite a few other monuments throughout the Hiroshima Peace Memorial Park. However, it was time for us to visit the Hiroshima Peace Memorial Museum. While the monuments in the park represented the large scale of the events in Hiroshima, the pictures, artifacts and stories from survivors in the museum showed the effect that the a-bomb had on individual people. After a somewhat heavy day of sightseeing, we decompressed (and rested our weary legs) with a delicious meal of Hiroshima-style okonomiyaki in the food court at the train station. This was another advantage of staying in a hotel right at the station. You can usually find a good selection of food options in Japanese train stations, and Hiroshima was no exception. We had a fairly early night, resting up for our next adventure. Our plan for the next day was to venture out from Hiroshima for a day trip to Miyajima Island. The post Japan – Hiroshima Peace Memorial Park appeared first on Airports and Sunsets. On our last day in Kyoto we did a walking tour that covered some of the highlights of western Kyoto. We did this with a guide we found on Tours by Locals. We had used them on a previous trip to Kyoto, and had a great experience. The specific guide we had used before wasn’t available for us, but he suggested another guide who turned out to also provide a great tour. We were particularly looking forward to seeing the famous Arashiyama Bamboo Forest as we had not been there on previous trips. It did not disappoint, and should definitely be on the itinerary for any visit to western Kyoto. Near the bamboo forest is Tenryu-ji, famous for its magnificent gardens. There are also major temples such as Kinkaku-ji (with the spectacular Golden Pavilion) and the zen temple Ryoan-ji (with its famous rock garden) which should be high on the priority list for any visit to Kyoto. After meeting our guide Meiko at Kyoto Station, we bought bus tickets and headed out for our tour. On the way to western Kyoto we made a stop at Nijo Castle. This is one of the most important (and busy) historic sites in Kyoto, so it was a good thing we got there just after it opened for the day, beating the worst of the crowds. As well as the grand scale of the buildings and gates, the architectural details and surrounding gardens are impressive. Unfortunately, we couldn’t take any photos inside the castle buildings. It was while walking through these buildings that we really saw the benefit of having a guide. Meiko told us stories about the shoguns that lived in the castle and their families, and historic events that took place there. After Nijo Castle, we took another bus to Kinkaku-ji. This is one of the most famous sights in Japan, let alone Kyoto. The temple pavilion completely covered in gold is spectacular, and we were lucky that the weather was good so we had some sunshine to reflect of the gold and provide a reflection in the pond in front of the pavilion. Here we also found another benefit to having a guide with us. It was nice to have someone to take a photo of the whole family. Meiko also provided us with information about the history of the temple, including the times it has burned down over the years (an unfortunately common occurrence throughout history for the wooden temples and shrines of Japan). After our visit to Kinkaku-ji we made a stop for lunch. We had a couple of different restaurant options, and decided to go for okonomiyaki. This is sometimes called “Japanese pizza”, but it’s more like a savory pancake. You can choose various seafood or meat options according to your preference. The really fun part about okonomiyaki is that it cooks on a hotplate right at your table. Once we had eaten our lunch, it was time to continue our tour of western Kyoto. The next stop was the famous zen temple Ryoan-ji. In the temple grounds on the way to the main temple building we passed a large pond covered in lily pads, and a large stone Buddha nestled serenely in the lush garden. The main reason to visit Ryoan-ji is to see the famous rock garden. If you are lucky, the temple won’t be too crowded and you can spend some time sitting and contemplating the garden, but if you’re unlucky there will be a school group making too much noise for meditation. The garden is designed so that it impossible to see all of the rocks from any one view point. Perhaps this is a metaphor for the futility of trying to understand everything, and contemplating Ryoan-ji can help us to embrace the uncertainty of life. Or you can just appreciate the precision of the raked gravel, and the ancient patina on the walls behind the artfully arranged rocks. After Ryoan-ji we boarded a tram to Arashiyama. This part of western Kyoto is famous for its bamboo forest, but there were a few other things to see there as well. This was a good thing as the bamboo forest was pretty small so it didn’t take long to see it and get some cool photos. Before we got to the bamboo forest we made a stop at a Shinto shrine where our guide Meiko taught us how to pay our respects to the shrine spirits. Near the shrine there was a lovely moss garden. I was very tempted to take my shoes off and walk on it, but I managed to to restrain myself. The bamboo forest was very impressive. It’s hard to capture in a photograph how tall the bamboo is. Even with a lot of people there, the soft green light and muted sounds made it a peaceful experience to stroll through the bamboo. To get back from the bamboo grove to Arashiyama town we passed through the Tenryu-ji temple. This temple is famous for its gardens, which were lovely. After a stop for some green tea ice cream, we checked out the last sight on our western Kyoto tour, the Togetsukyo bridge. With our tour of western Kyoto completed, we headed back to Kyoto Station where we said goodbye to Meiko and thanked her for the great itinerary she had planned and all the information she had given us along the way. After a sushi dinner at one of the station restaurants, we explored the modern station building. This was an interesting contrast to the historical buildings we had seen during the day. As we left the station to head back to our AirBnB we saw another contrast to the ancient Kyoto sights – Kyoto Tower. Three full days was enough to see some Kyoto highlights, and explore some lesser-known places and back streets. There is so much to see that you could spend much more time here, but we had more to see and do elsewhere in Japan. So, after a good night’s sleep to rest up from our very full day touring western Kyoto, it was time for us to make our way to our next destination – Hiroshima. The post Japan – a Tour of Western Kyoto appeared first on Airports and Sunsets. After all the walking on our first day in Kyoto, we had a bit of a slower start on day two. The planned highlight of the day was a family kaiseki lunch. Kaiseki is a traditional Japanese multi-course meal, featuring seasonal ingredients and an elaborate presentation. As a major center for Japanese traditions, Kyoto is a great place to experience a kaiseki meal. These meals can be very expensive, and a lot of kaiseki restaurants don’t allow children. Fortunately, our AirBnB host was able to make a reservation for us, and we managed the cost by scheduling our family kaiseki experience for lunch, which is a less expensive option than dinner. Even with a bit of a slow start, we had some time before lunch to explore the area close to our AirBnB, a short distance northwest of Kyoto Station. Although it was raining intermittently, we managed to see some lesser-known, and even quirky sights. The first one (which we actually stumbled across by accident), was the original Nintendo building. This was very exciting for video game enthusiast Lachlan. Our next stop was a place I had read about in the wonderful Atlas Obscura, a great resource for finding things to see that are not your average tourist attraction. Mimizuka, or “Mound of Ears” is a burial mound for noses and ears collected by Japanese soldiers as war trophies in the 16th century. Next to Mimizuka there is a children’s playground, featuring a happy blue hippo. Our next stop was a more traditional tourist site, the Toyokuni-Jinja Shrine. This place doesn’t get as many visitors as the more popular temples and shrines, but is well worth a visit. A special feature of this shrine is the treasure house, where you can see artifacts from the shrine’s history. Another interesting feature right next to the Toyokuni-Jinja Shrine is a massive bell. It weighs in at more than eighty tonnes. Unfortunately, the giant Buddha that was planned to be located with the bell was never built. The bell sits in a belfry that is all that remains of Hoko-ji temple. The rest of the temple was destroyed by an earthquake in 1596. After our morning sightseeing, we were ready for lunch. We made our way to Harise, a restaurant that has been in business for more than 350 years. Even for a city as steeped in history as Kyoto, this is an impressive number. The staff greeted us warmly, showed us where to put our shoes then led us to our private room. The room featured a lovely view to a small garden. Our waitress presented us with the customary hot towels and we settled in for our family kaiseki experience. Over the next couple of hours, our waitress served a series of courses, each beautifully presented. The kids didn’t like the small fish that are meant to be eaten heads and all. However, generally the food was fresh and flavorful. We even had two dessert courses, although in the Japanese style these were a lot less sweet than typical western desserts. After finishing our meal with a matcha green tea, we all agreed that we were glad we had chosen lunch time for our family kaiseki experience, because we definitely didn’t need the extra courses (with accompanying extra expense) that would have been served if we were there for dinner. After our major lunch event we headed back to our AirBnB apartment to recover. While the kids were done with sightseeing for the day, the grown-ups decided to check out one of Kyoto’s most iconic sites, the Fushimi Inari Shrine. After taking a train a few stops south from Kyoto Station we entered the shrine through the massive entrance gate. A light rain enhanced the look of the moss-covered stone lanterns and shrine guardian statues. The main reason for visiting Fushimi Inari is to see the walkways lined with bright red torii gates. Business owners donate these gates to the shrine in thanks for (or in hope of) good fortune. In parts of the trail leading up the mountain behind the entrance gates the torii gates are so close together they almost form a tunnel. As well as the torii gates, it’s interesting to see all of the small sub-shrines that you see along the way as the path climbs the mountain. These are mostly Shinto shrines, but some Buddhist statues and altars are also sprinkled amongst them. We were there too late in the day to walk all the way to the top of the mountain behind the shrine, but we did manage to get a good workout following our big lunch. We made our way back to the train to head back to Kyoto Station as light was fading. A treat from Mr Donut was our reward for our Fushimi Inari hiking efforts, and the futuristic Kyoto Station building was an interesting contrast to the historic sights and experiences of the day. The post Japan – A Family Kaiseki Meal in Kyoto appeared first on Airports and Sunsets. This post will cover the first part of our time in Kyoto, including our self-guided walking tour through eastern Kyoto. After our stopover in Narita, we were up early the next morning to meet our friends at the airport. After finding some breakfast in one of the terminals, we made our way to the Japan Rail office and exchanged our vouchers for JR Passes. We booked our seats on the shinkansen (bullet train) to Kyoto, and headed off on our Japan adventure. We arrived early in the afternoon after enjoying a few hours whizzing through the Japanese countryside and towns. Our AirBnB was an easy walk from the station, and accommodated our group easily. We would definitely recommend it if you’re looking for a place to stay for a group of people in Kyoto. After settling in, we ventured out to explore Kyoto. Our first mission was to find the Pokemon Center. Lachlan wanted to visit as many Pokemon Centers as possible while we were in Japan. This was actually the second one we visited, as we had already visited the small Pokemon Center in Narita Airport. The Pokemon Center is in a large department store, so the members of our group who are not into Pokemon had other things to look at, checking out some of the weird and wonderful things you can find in a Japanese department store. We were all starting to feel the effects of our recent long plane flights, so we grabbed some refreshments from a vending machine (always easy to find in Japan) and took a break sitting on the bank of the Kamo River in the late afternoon sunshine. By now it was getting late enough in the day that we were starting to think about finding some dinner. We were all a bit jet-lagged, so decision-making wasn’t easy. We wandered down the very scenic Pontocho Alley in search of a place to eat. We found a restaurant that had a variety of different types of food, thinking this would be an easy option for our first group dinner of the trip. Despite a few issues with the restaurant service (very unusual for Japan) we eventually managed to get something to eat. We then headed back to our AirBnB and slept very well. For our first full day of sightseeing, the plan was to check out the temples and shrines of eastern Kyoto. However, our first stop was the Kyoto Imperial Palace. When we had previously visited Kyoto you could only see this place by reserving in advance. Now that you don’t need to make reservations our lack of advance planning skills didn’t keep us from seeing it like it had in previous visits. Before entering the palace grounds we explored some of the outer gardens. Once we had paid our entrance and made it into the palace proper, we saw some impressive buildings. As well as the impressive scale of the palace buildings, the architectural details (featuring lots of gold) were impressive. We were particularly impressed by the meticulously groomed gardens. The palace designers strategically positioned them outside the rooms of the highest ranking members of the imperial family and their staff. After the Imperial Palace, we headed east to Ginkaku-ji, the Silver Pavilion. Shops selling souvenirs and various kinds of food line the road leading to the temple. A lot of the people we saw on the street were school students. Many school groups come to Kyoto to visit the significant and historical sites in the city. The Silver Pavilion at Ginkaku-ji is not actually covered in silver, unlike the Golden Pavilion at Kinkaku-ji which it was modeled after. The initial plans to cover the pavilion with silver foil never happened. For me, the gardens are the best thing about Ginkaku-ji. It’s a lovely walk through the moss and carefully groomed trees and shrubs. We continued our eastern Kyoto journey with a visit to the Honen-in temple. This is much less visited than other temples, so was a nice respite after the very busy Ginkaku-ji. Honen-in is a place where you can sit and feel some peace and serenity, much more of a zen experience than the more famous and crowded temples in Kyoto. A Japanese tour group who came to check out the temple’s Buddha statue briefly interrupted our peace, but it wasn’t long until they were gone and serenity returned. From Honen-in, we continued down the Philosopher’s Path (also known as the Path of Philosophy or Philosopher’s Walk). Although the name may sound like it has been passed down through the ages, the name comes from a 20th century Kyoto University philosophy professor who used it for his daily walk to contemplate and meditate. As a break from historic sites, we stopped at a small do-it-yourself pottery shop on the path. The instructor very patiently guided members of our group through the process of making a small bowl on a potter’s wheel. Each craftsperson selected a glaze color for their bowl after shaping the clay. The store owner later fired the bowls and mailed them to us back home in Houston. A little further down the Philosopher’s Path we came across an unexpected highlight of our day in eastern Kyoto. Intrigued by a sign featuring a couple of cute mice, we decided to check out Otoyo Shrine. We found a small shrine complex with an interesting collection of guardian animals. The final stop on our walk through eastern Kyoto was Nanzen-ji. This is a large Zen Buddhist temple complex with quite a few different things to see. After walking through the large entry gate, there is a large incense burner. The incense smoke is to purify visitors before they visit the temple. Next to the incense burner is the Dharma Hall, with an impressive painting of a dragon on the ceiling. Probably the most interesting thing at Nanzen-ji (perhaps even in eastern Kyoto) is the aqueduct. This was built in the Meiji period (late 1800s) as part of a plan to modernize the city’s water supply system. The plan was never fully implemented, leaving the Nanzen-ji aqueduct as a curious oddity. You can climb steps behind the aqueduct and walk along the canal leading into the forest. We were lucky enough to see a grey heron resting peacefully next to the rushing water. As the light was fading we had just enough time to visit the Nanzenin garden. This is a lush and peaceful zen garden built around a pond. A stroll around this peaceful place was a fitting end to our eastern Kyoto adventure. The post Japan – a Walk Through Eastern Kyoto appeared first on Airports and Sunsets. 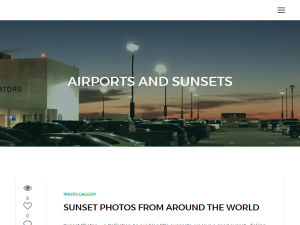 If you are the owner of Airports and Sunsets, or someone who enjoys this blog why not upgrade it to a Featured Listing or Permanent Listing?